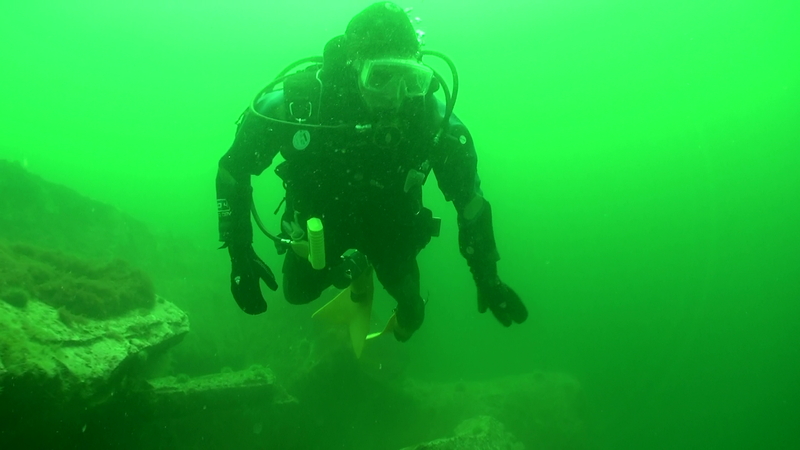 We had anchored over the wreck and were pleased to see the visibility was about 15 feet. I pursued hermit crabs in moon snail shells with my camera. LD lobstered. Pete scootered. Bill Low took pictures and brought the cupcakes for Memorial Day. Pat cooked hot dogs to order. French’s or Gulden’s? The Captain practiced with his video camera and his Mares suit. Our second dive was at the back side of Kettle Island. 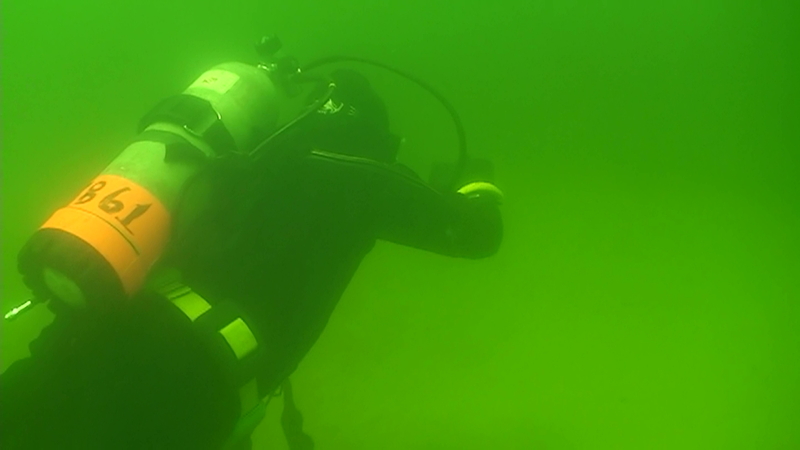 It was 57 degrees here too, but colder on the bottom where the water was clearer , ~20 feet of visibility there. I found a decorator crab on an abandoned lobster trap. 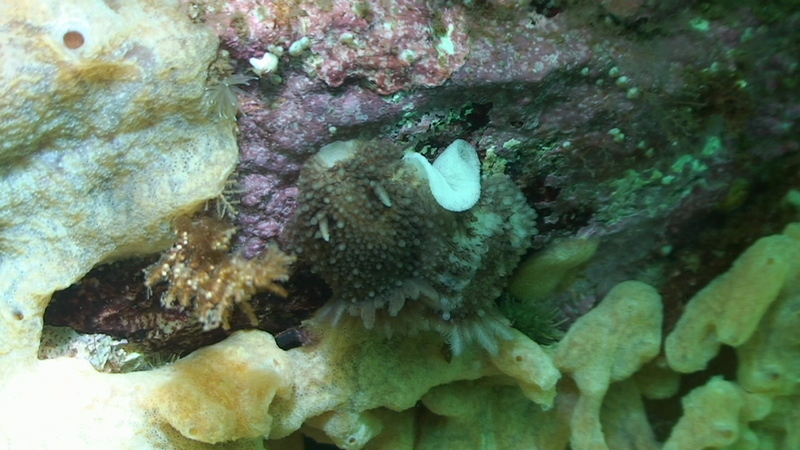 He had attached little bits of yellow sponge to his shell which matched the sponge on the trap exactly. LD brought me another one that had a long trailing brown train of sea weed. It looked completely different from the first one. We saw a dead dog fish and several dead skates under the area where a fish weir had been staged earlier this month. 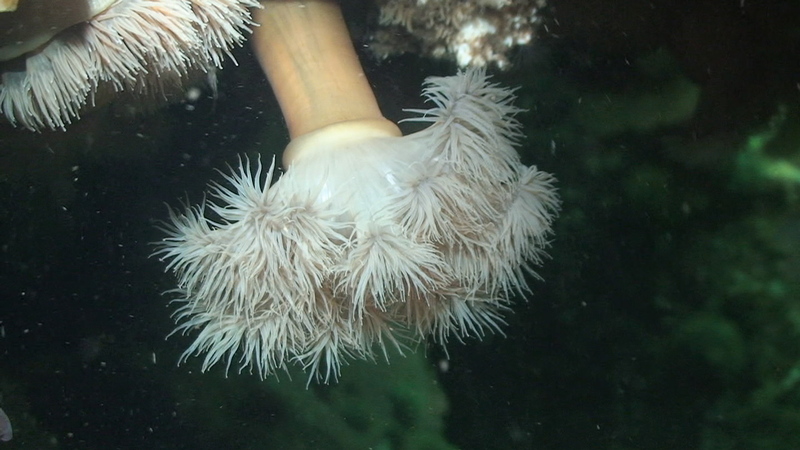 Sad to see their white bodies against the deep brownish red sea bottom. At least olive snails had a feast. I drained both my tanks. It was cooler and dryer and sunnier today. All in all, better than we’d hoped. Divers included Jacki K., Bill Low, Gary from the Northshore Frogmen and LD. Pete was crew. The Captain was in his Mares semi-wet suit and I dove in one of Pete’s DUIs while Margaret at United Divers repairs the zipper on my Atlan. We made the first dive at Lanesville Shores, near Tide Rock. We anchored near another dive boat that was very luxurious and had many spectators/family on board. The breeze was fresh from the NNE and sent rocking waves our way. It wasn’t a smooth set but we were looking for a weight belt that had been lost a few days ago (and didn’t find it). In 25 feet, the visibility was about 20 feet, according to Pete. He also found the first “too big” lobster of the season. LD caught several. It was 52 degrees on the bottom but the visibility was 30 feet or more. You could see it opening up as you hit the bottom of the down line. After finding a nudibranch all by myself, we parted ways as my air got low. Later she said she’d seen a beautiful on one on the edge of a kelp frond. We motored home with a following sea – not the most comfortable kind for a smooth ride. Tomorrow we get to do it again. We had a great time today. It was cloudy and muggy with very little wind. Air temp was 72 and the water was 55 on the first dive at Mitchell/Dodge/Bartlett Rock in Rockport. We had Linsley and Kevin Mordasky, Linda and Kerry Hurd, with Diane K. as well as LD. Everyone was in quickly to explore this site that we rarely visit. It has huge split boulders and lots of rubble. I descended into a group of pollack who paid me no mind. 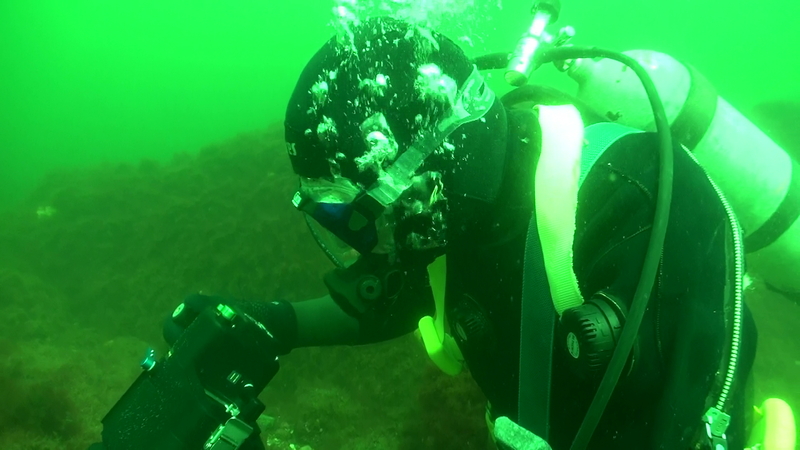 Visibility varied from 10 – 15 feet and was very green. The clouds kept the ambient light low. Kerry said there were very large red-gilled ones – a couple of inches long. He said they were among the most numerous in this area. I have to take his word for it, because I haven’t received Jerry Shine’s book yet. When I do, then I’ll know more. Peter lost and retrieved his own weight belt and noted that the water was 52 degrees at 50 feet. The skies cleared as we returned up the almost flat ramp. It was sunny and HOT. The Beaufort scale measures wind speed and wave conditions. Beaufort 0 is what we had today – flat calm seas and zero wind. The air temperature was pleasant in the mid-60s. Perfect-o. 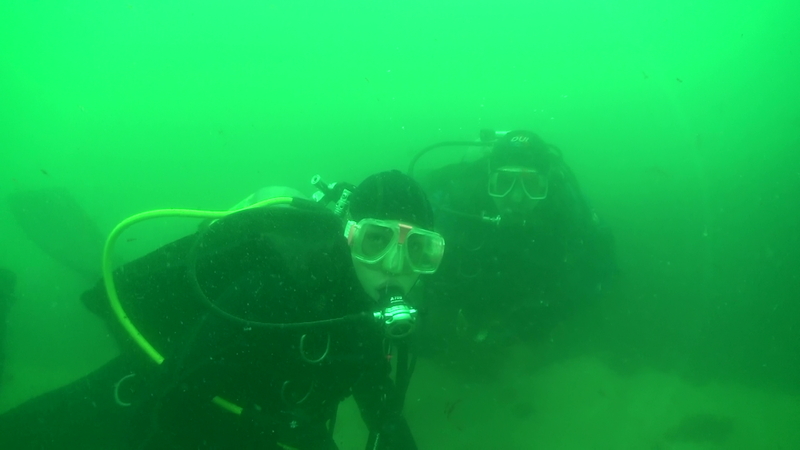 We had two members of the Northshore Frogmen, Jeff L. and John M. They were joined by LD. Pete was crew. The Captain got wet and I drove the boat. We drove up the Annisquam River to the north side of the island and experienced these perfect conditions first at the restaurant at Folly Cove. I had nosed around Halibut Point a little just to confirm that we had the best of all possible situations and was met with about a 10 degree drop in temperature, surging waves around the rocks and rollers coming in from the east. Not as good as we’d already seen, so I held the helm over in a gentle U-turn and dropped anchor just off the Lobster Pool in about 30 feet of water. 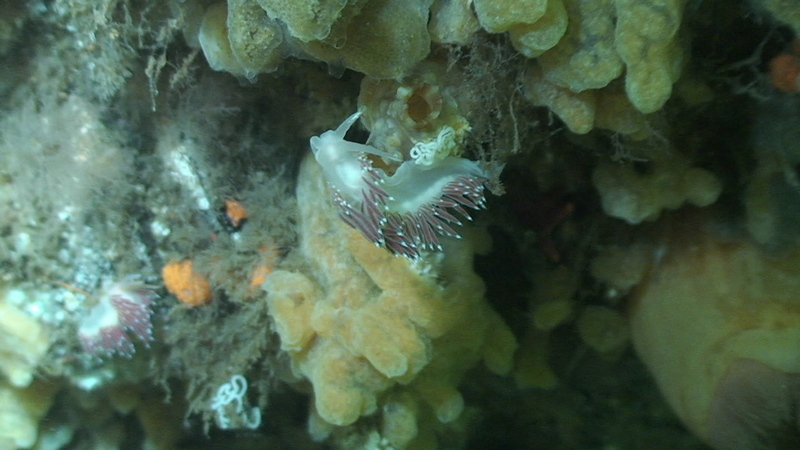 We’re not experts in identifying nudibranchs, but Jerry Shine is. His book is my next purchase so I can be sure what I’m seeing. As you can tell, the water was clear and the visibility was fine at about 20 feet. 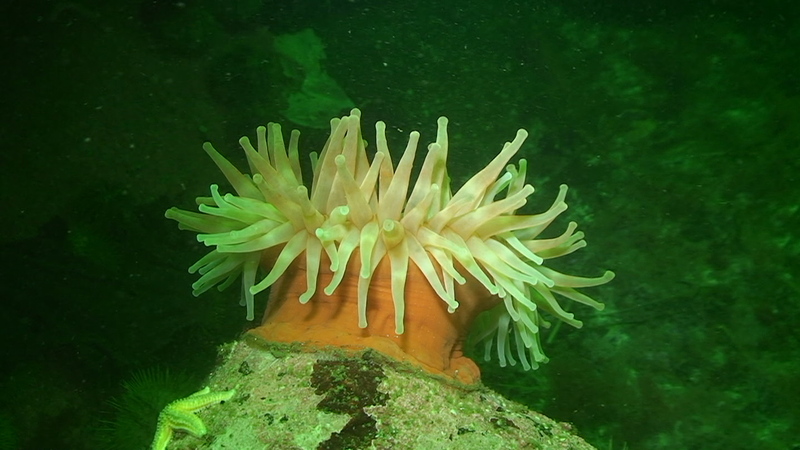 The second dive was at Lanesville Shores where the conditions were about the same – WONDERFUL. We all had fun and hoped these days continue far into the future. The weather certainly did a turn around for today’s dive. There were light winds predicted from the south with clear skies and low humidity. Temps in the upper 60s. We had Patrick M from RI with us as well as LD and crew members Pete and Pat. The Captain was suiting up for real today. I drove the boat. I picked Lanesville Shores for the first dive. It looked calm and as the anchor sank below the bow, I could make out the rope as it descended. That would make for a clear dive, I thought. Sure, enough the water was 50 degrees and visibility varied from 20 feet down to less than 10 where the others had passed by. As his irritation grew, the stream of bubbles turned a little blue, I thought. We finished with a flat ramp and a general agreement that this had been a super day. The weather was supposed to be clear and warm. Huh. As we pulled under the Blynman Bridge into Gloucester Harbor, the sun was completely clouded over. The air was in the low 60s – and cooling off. We had LD onboard with Pete as crew. The Captain determined that LD should learn to drive the boat, so we took turns coaching him. He pulled out the of slip, made a 360 degree turn, and proceeded to the gas dock for a fuel tank top off. Then he took it under the bridge because we could. The tide was almost low and there were two or so feet of clearance. 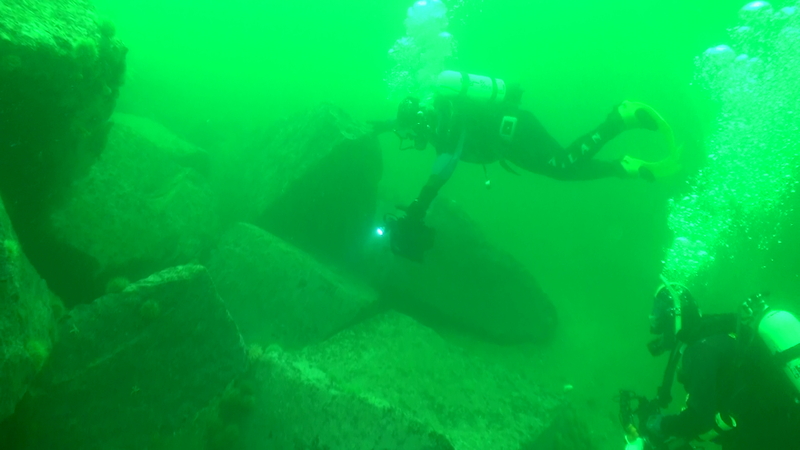 The best south shore dive sites were already obscured by fish weirs. There was one at Kettle Island and another one at Saddle Rock. LD pointed out two more that were being deployed at Egg Rock and down further towards Manchester-by-the-Sea. 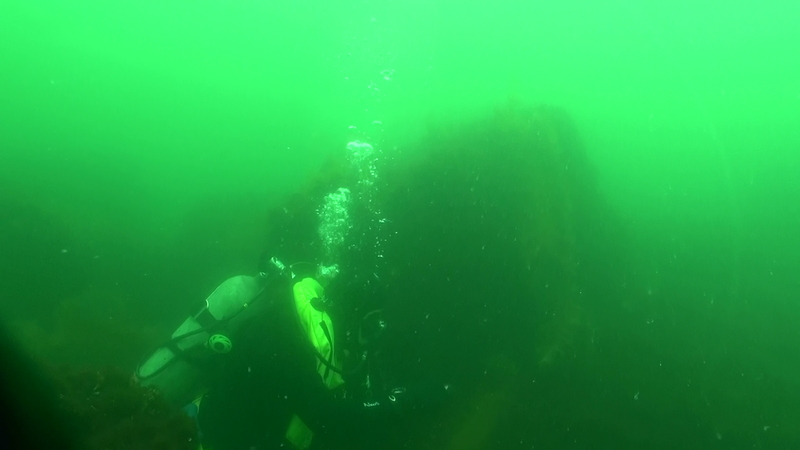 We decided that the wreck of the USF New Hampshire was our best bet. The diggers agreed. There was absolutely no wind at all. The tide was almost all the way out. We anchored right over the wreck and as I descended the anchor line, I noticed it was slack. On the bottom, the gloom was complete. There were deep troughs in the sand ripples and each was filled with sea weed shards. There was “whale snot” in the water column and not much light on the bottom at all. I swam around looking for a protected place behind the island that might have better visibility than the 5-7 feet I was experiencing in the 50 degree water. No such luck. 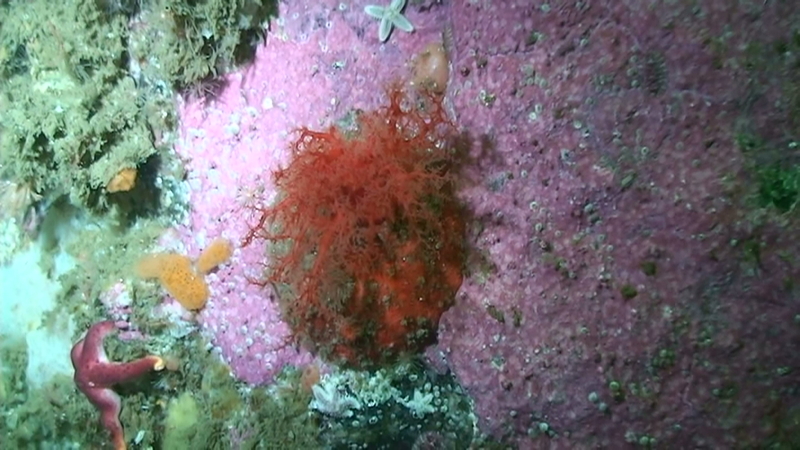 I tried to video an abandoned lobster pot in the hopes of finding its resident decorator crab. Nobody home. I cut the dive short and headed back for some warmth. 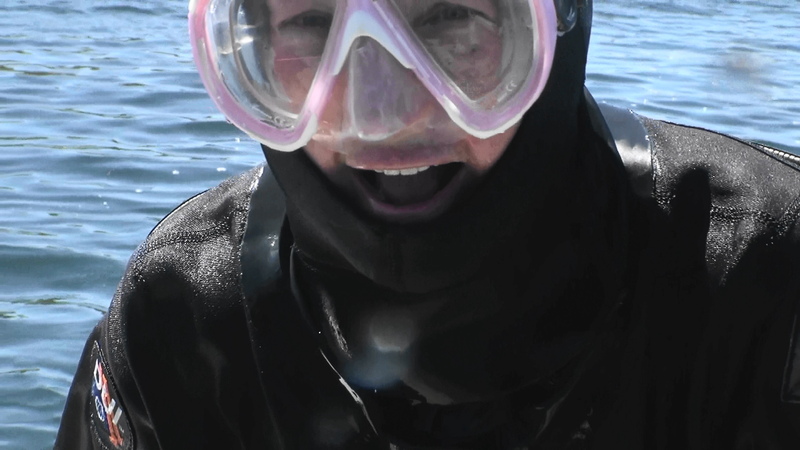 Upon doffing my “drysuit,” I confirmed that the coldness wasn’t just psychological. My suit DEFINITELY needs a new zipper. Oh well, there’s always next weekend. We learned from Pete that the water was 50 degrees, but the visibility was only about 15 feet as the tide bottomed out. We were pleasantly surprised to have the conditions improve over here because the wind was from the NW and that was producing some chop. Apparently that didn’t affect the deeper denizens at all. You’ll note that both frame grabs were from LD’s. Somehow, I managed to shoot the whole day’s video on “telephoto” and didn’t get anything centered in the frame. The return home was smooth and, on the climb up the steep ramp, I got blasted in the face with the hot wind over the asphalt parking lot. It was certainly over 80 degrees on land. Today was predicted to be clear and sunny, but started out cold and cloudy. We loaded the boat under dreary skies with a stiff east wind. The divers on board were LD and Alan Hicks. Crew was Pete while The Captain strode the deck. Since yesterday’s second dive site had relatively good visibility, we decided to return to the back side of Kettle Island. 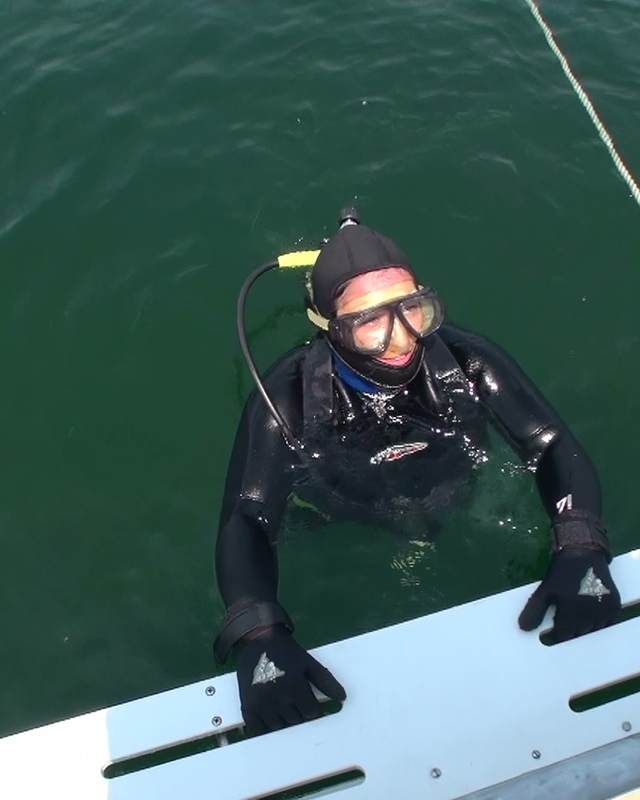 Alan donned his wetsuit for his first dive of the season in 46 degree water with an air temp of 47 degrees. Brr-r-r. Here’s a picture of him checking his air in about 25 feet of green ocean. LD and I arranged to video a shot with him and his camera with its lights blazing. Although I spent the first half of my dive just cruising around looking for him, I was able to find him before my hands got too cold. Here is his reaction to a light’s arm that wouldn’t stay deployed. We all agreed that one dive was enough for today, so we made our way home while the tide was still high enough to allow for an easy trip up the ramp with our empties. Can’t wait for warmer times. Our first charter of the season was today. We had George and his son, Chris, as well as Linda from UMass Medical School and LD. Crew was Pete and Pat. The Captain maintained order. 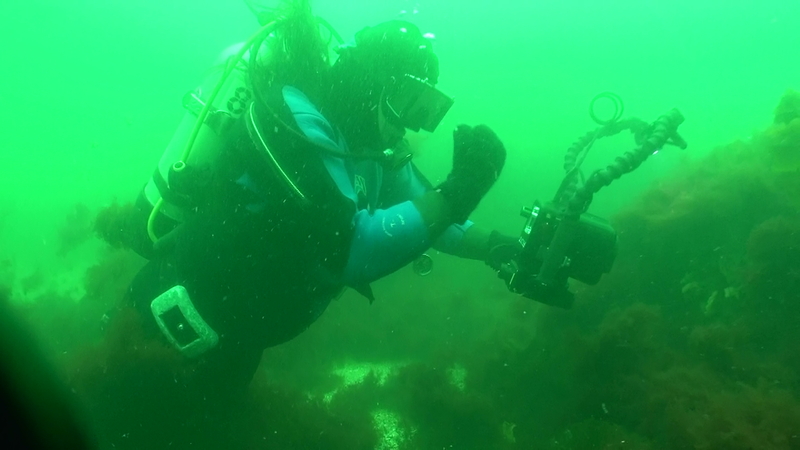 Because Chris wanted to get a spike, we motored out of Gloucester Harbor down to the wreck of the USF New Hampshire. The water was cold at 46 degrees and the air was only a little warmer at 48 degrees. Skies were grey but there was only a little wind. Here are Chris and George on the bottom with visibility of about 5-7 feet in about 20 feet of murky water. We made a second dive behind Kettle Island and it was a little clearer – about 10 feet on the very bottom. I think that was the case because the tide was high and the “whale snot” that filled the mid-water space wasn’t as prevalent on the bottom.